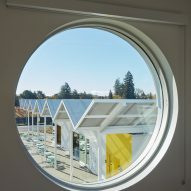 Los Angeles firm Bestor Architecture has built a white complex for a winery in Napa, Calfornia, complete with porthole windows and a zig-zag pavilion roof. 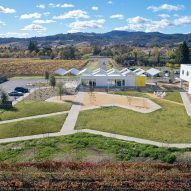 Ashes & Diamonds comprises two different volumes – a production warehouse and a wine-tasting space – situated together on a spacious property close to downtown Napa. Owner Kashy Khaledi sought a modernist design with a relaxed feel, so Bestor Architecture looked to the architecture of Southern California's desert cities, but put its own spin on the style. 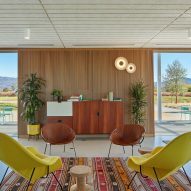 "While there are nods to Albert Frey in the portholes and Donald Wexler's folded plate roofs of the mid-century Palm Springs postcard fantasy, we aimed for a lighter and more current take, fitting to the industrial nature of wine production and more residential scale of the hospitality," said Bestor Architecture. 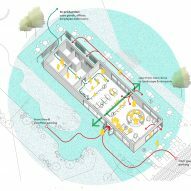 Both of the buildings have straightforward skeletons, with the production facility made of pre-engineered, insulated white metal panels, and the smaller one-storey volume with a wooden frame finished in stucco. A zig-zag canopy, also made of prefabricated steel sections, tops the smaller unit. 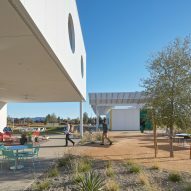 This pavilion adds character to the box-like construction, while filtering the region's strong sun. 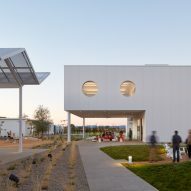 "The canopy screens the flat roof below, and was a less-expensive way to provide a roofline without building an actual folded plate roof as part of the building," said Bestor Architecture. The production building spans two-storeys and is designed as a warehouse, with porthole windows upstairs adding a modernist touch. Measuring 19,840 square feet (1,843 square metres), the facility houses hundreds of wine barrels, as well as an intimate gathering space on its ground floor. 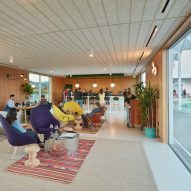 "The client required a serious production facility that could produce up to 10,000 cases of wine per year as a boutique winery, and provide hospitality spaces that felt like a comfortable modern living room," said the firm. 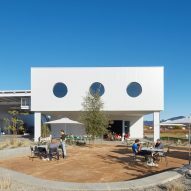 Unlike other vineyards in the famous winemaking area, which have to close around 4pm, the winery can serve food while hosting tastings and stays open until sunset because it is within the city limits. 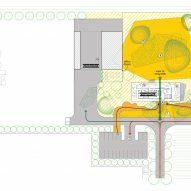 A bright yellow pivot door connects the outdoor tasting area with its indoor counterpart, housed within a rectangular construction that measures 2,008 square feet (186 square metres). Inside, a bar at the far end of the space is made from white terrazzo, and accompanied by dark green accents. Walls are finished in vertical grain Douglas fir plywood, with Tectum acoustic panels across the ceiling. 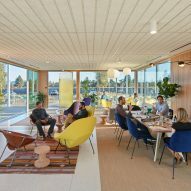 "Interior wall and ceiling finishes provide texture, warmth, and acoustics in the mostly-glass box with terrazzo floors," said Bestor. For furnishings, the firm continued the modernism theme – using vintage mid-century pieces alongside contemporary designs. Cork stools by Vitra and purple armchairs by Hay feature, as well as other Saarinen reproductions by Knoll. 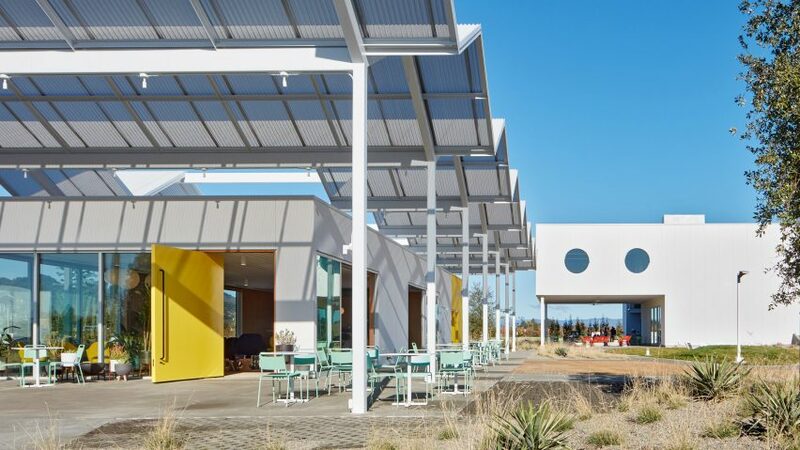 Napa is home to countless wineries, including gabled project with an outdoor hallway by Field Architecture and a set of open-air tasting pavilions by Walker Warner. 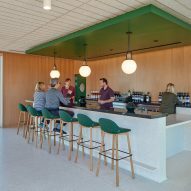 Wine is also produced further north, where similar facilities include a tasting room in Oregon with a dramatic slanted roof by Lever Architecture, and a low-lying winery with earthy materials in Washington by GoCstudio.